Last Wednesday night, I comfortably sat in a corner of a lovely French cafe. I love how it is at 10 in the evening; quiet, almost empty, but still charming as it has always been. When I took my phone out to take one quick snap, my husband asked me if I have already blogged about it. 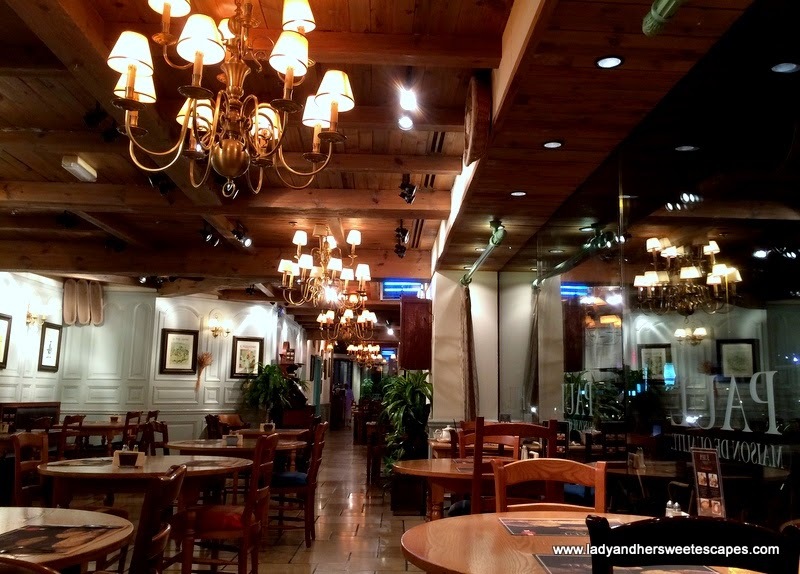 It was then that I realized that I have never shared the goodness of our favorite French cafe on this blog. Oh no! It's not my intention to keep PAUL all for myself! 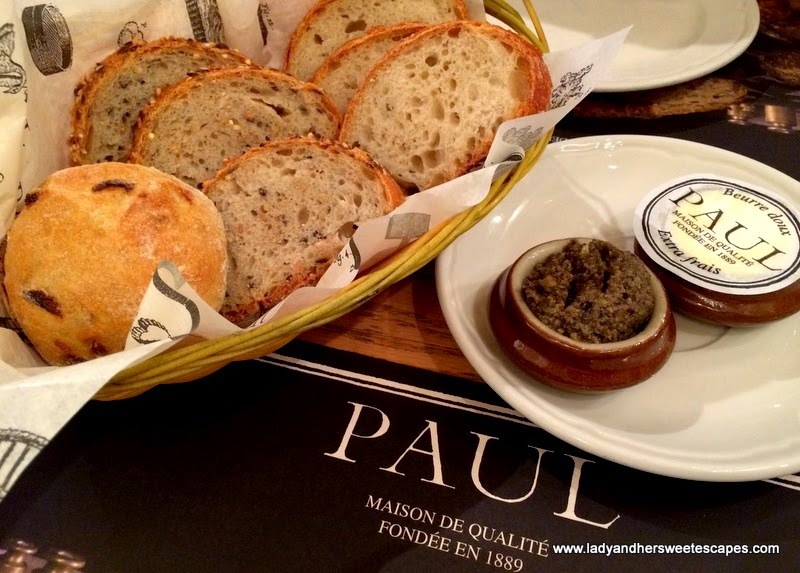 PAUL Bakery and Restaurant in BurJuman has been our constant date venue; be it for breakfast, lunch or dinner. I never got to blog about it though. A quality time in Paul is also some sort of a digital detox time for me and Ed. So, we usually end our meals without any photos. Or if ever I have, only a few decent ones solely for Instagram. As our recent visit was our anniversary night, I wanted to keep my hands away from my phone as much as possible. But then, I also felt it was about time to share something about PAUL. So, I did my blogger tasks as quickly as I can! And now, I think I finally got blog-worthy iPhone photos for a long overdue feature. Although PAUL is famous for coffee, their cocktails shouldn't be missed as well. 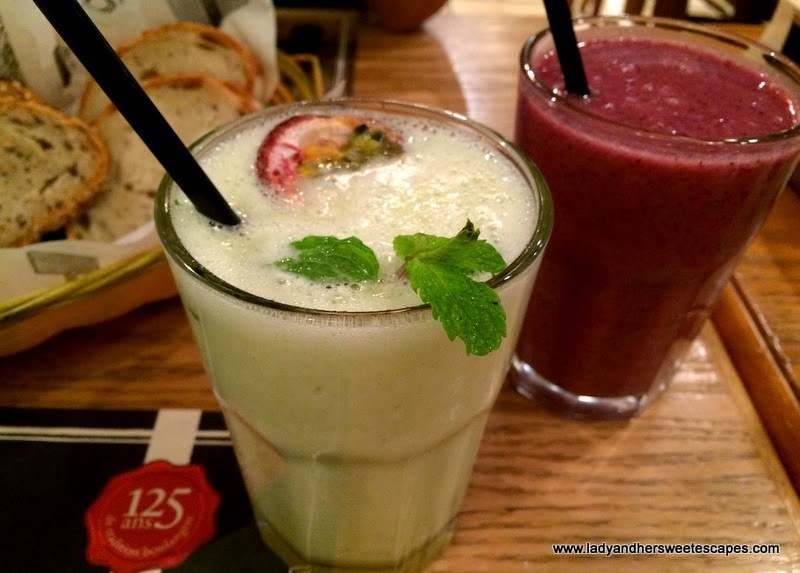 I recently had Banana Berries; a wonderful blend of berries, red grapes, banana and fresh apple juice. It is so good that I wished they are offering super sizes! Ed is into any drinks with ginger, so he had the Passion Fruit Ginger cocktail. PAUL's new blend is a little weird for me, but it sure made my ginger-loving husband happy! I usually head straight to the mains, but last Wednesday, I needed something warm, something that could help me shoo off the flu that was lurking around the corner. So, I got PAUL's best selling traditional French onion soup. It was served hot and topped with cheese in a toasted bread bowl. 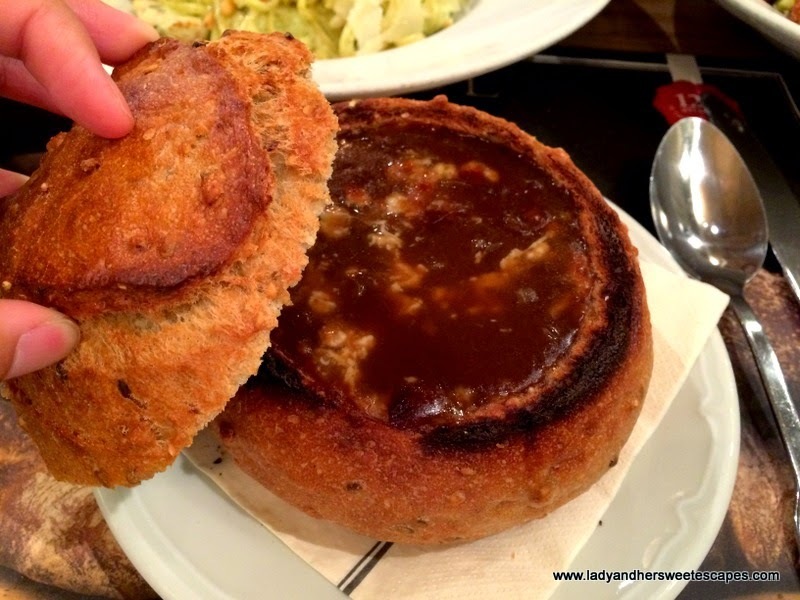 The soup is rich and creamy, with a hint of sweetness from the caramelized onions! Ed, who has been super health conscious lately, ordered quinoa salad with salmon for dinner. I really thought he's going to end up reaching for my meal, but what happened was the other way around. 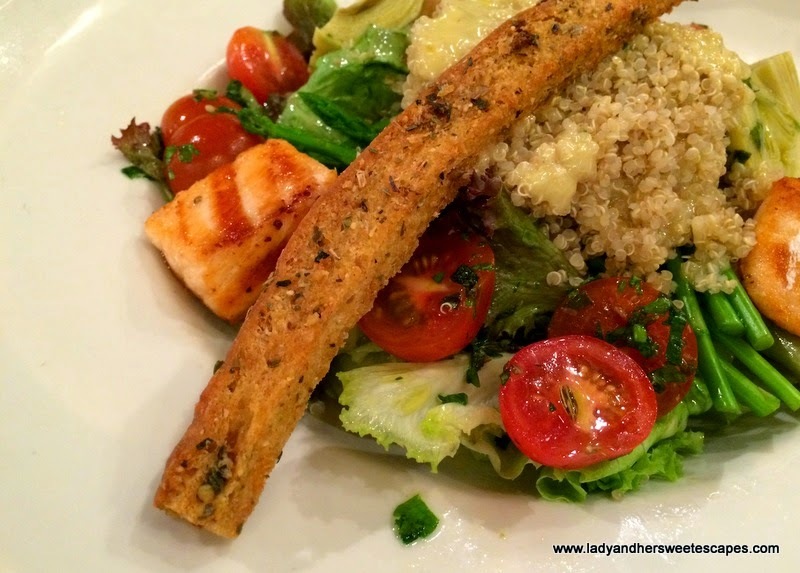 PAUL's Salade Quinoa Nature looks beautiful, healthy and very inviting. The serving is huge, the vegetables are crisp, the pieces of salmon was grilled to perfection and the quinoa is very filling. Hence, that salad bowl turned out to be a nutritious dinner for two! I ordered a linguine pasta. I stared at its beauty while I was gobbling Ed's healthy salad. 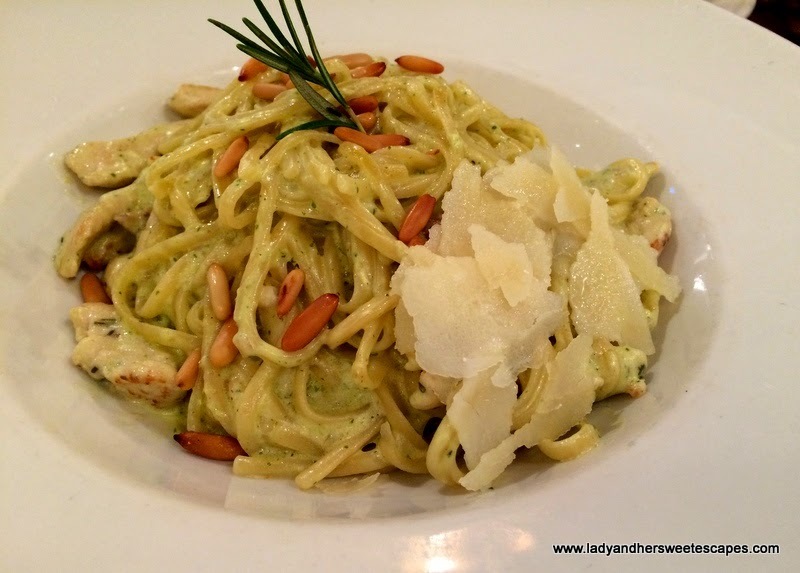 The pasta and chicken slices were smothered with creamy pesto sauce and exquisitely topped with pine nuts! Flawless! Just by the mere sight of it, I knew it's going to be on my favorite pasta list. But, I only twirled my fork on it once and asked the staff to wrap it for me. Blame it on the quinoa! I was so full. Anyhow, I relished its goodness the next day. It was still delish, yet I think having it fresh and warm in the restaurant would be sublime. As it was nearly closing time, Ed and I skipped dessert. Too bad as their cakes and pastries are extremely good. If we had enough time (and space in our stomach), we'd surely grab a slice of Fleur de Lis! * To find a branch near you, please check Paul's official website.